Now who doesn’t like cheesecake? Not many people I know, to be sure. My husband is a huge fan but to be honest, I haven’t mastered the fancy ones yet. If you’re new to baked cheesecakes, this is probably the easiest one to start off with and is very tasty, although I have to admit a nice fruity coulis or perhaps a blob of Chantilly Cream, or even my old favourites – Lemon Curd or Chocolate Ganache poured over the top, would complement it very well. I normally just prepare the refrigerator ones, but there is an art to baking a cheesecake and a few things to watch out for. Firstly, a cheesecake isn’t a cake, it is a custard and needs to be treated very gently and baked at a moderate temperature. All ingredients MUST be at room temperature as this will assist with getting the cream cheese smooth. Beat the cream cheese until absolutely smooth prior to adding the eggs as overbeating the eggs may incorporate too much air which may cause the cheesecake to rise too quickly, causing the top to crack. Be sure to only beat the mixture after adding the eggs sufficiently to incorporate them into the mixture fully. Secondly, if the oven is too warm or the cheesecake is left to bake for too long, it will be dry and the top may crack. If your recipe calls for you to bake it until firm, and you find that it tends to be dry, try another recipe. I’ve read that cheesecakes should still be slightly “jiggly” in the centre when finished baking. Obviously that doesn’t mean “runny” but certainly not firmly set like a cake. Don’t worry if it isn’t perfect the first time you try it, hardly anyone gets it right the first time. It will take time and patience and of course, as with any baking, you have to know your oven really well in terms of the “true temperature”, best shelf height for the item you’re baking, and how long your creation should actually be left inside. Allowing the cheesecake to cool too quickly may also cause it to crack. Some recipes call for the cheesecake to be left in the oven to cool with the door ajar, but I worry that this may overcook the cheesecake, causing it to dry out so honestly, play around and see what works best for you. I find that baking a cheesecake in a water bath or “bain marie” works well, but some bakers don’t like this method as if your tin leaks at all, water seeping into the cheesecake will obviously cause a huge flop. By wrapping the springform tin in a few layers of tin foil, this stops the water getting through and I find a water bath allows for a more even distribution of heat, helping the cheesecake to bake more evenly. The recipe below is from an old Australian Women’s Weekly cheesecake recipe book so is well and truly “Tried and Tested” but if it doesn’t work for you or you have others you prefer, do whatever works for you. I’ll try to be more adventurous next time :). Other bakers may have other useful tips but the above points certainly help the novice, like me. Process the biscuits until they resemble fine breadcrumbs. If you don’t have a processor, put them into a large Jiffy/Glad bag and remove all the air before sealing it. Then bash with a rolling pin – little kids love doing this! Add the melted butter and process until just combined or stir quickly to combine. Press the crumb mixture evenly over the base or base and sides of a 23cm springform tin. Cover the tin and refrigerate for 30 minutes or until the crust is firm. Meanwhile preheat the oven to moderately slow (!) – yes, that’s as helpful as the recipe is so I checked my oven’s manual and that is somewhere around the 160°C or 325°F mark. Beat the cream cheese until smooth, then add the sugar and vanilla extract, incorporating it well. Add the rind, juice, egg yolks and cream and beat until light and fluffy. Beat two of the egg whites separately in a small bowl with an electric mixer until firm peaks form and then fold this gently into the cream cheese mixture. Discard the remaining egg whites. Wrap the sides and bottom of the tin in a few layers of tin foil, sealing it very well (if using the water bath method). The original recipe doesn’t call for this but I prefer this method. Place the tin on a cookie tray or similar baking tray with sides as it holds the water or if not using the water bath method, it is still easier moving the cheesecake tin around on the tray. Pour the cheesecake mixture into the tin and place in the oven. With the door ajar and being careful not to burn yourself, pour hot but not boiling water into the cookie tray until it is a way up the side of the springform tin. Some of this water will evaporate during baking. Don’t overfill the tray as you don’t want any slopping into the mixture as you slide it fully into the oven…I hope this is clear and isn’t confusing. Bake for about one hour or until almost firm. Cool in the oven with the door ajar (I’m wary of this) or move to a cooling rack. Be careful when removing from the oven that the remaining water in the tray doesn’t splash onto you. When cool, refrigerate the cheesecake for at least 3 hours or overnight. Remove from the tin just before serving. You can gently slide an offset spatula around the sides of the cheesecake to help the sides to come away from the tin, but be careful. Releasing the springform tin gently should be enough to leave beautiful clean sides. 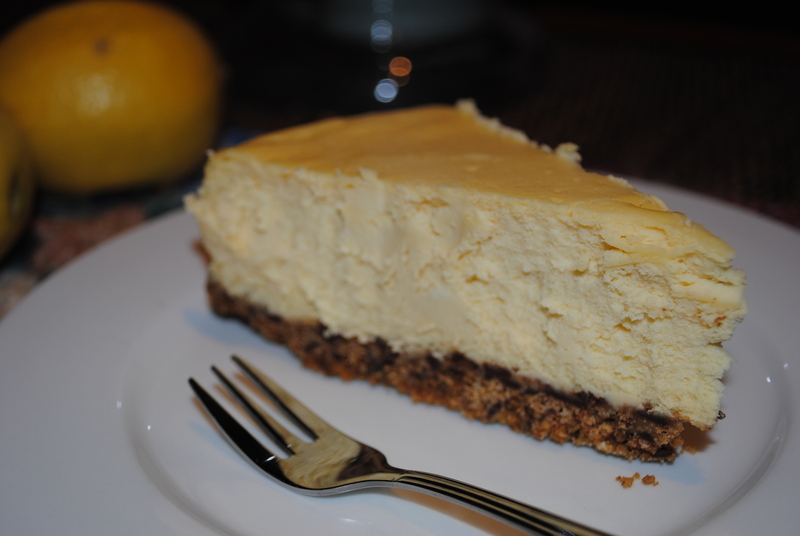 Pingback: Recipe: Cheesecake | All about food.